Here in the Northern Hemisphere, it’s Lammas (“loaf mass”), also known as Lughnasad, a time to mark the first harvest and to acknowledge the gradual decline of the sun after the Summer Solstice. You and your loved ones can celebrate the occasion by meeting over a late summer or early autumn meal, then playing this game. May you never hunger and may you never thirst. Enjoy! A. Gather in a circle, whether around a table, on the floor, or wherever. Place a beeswax candle in the middle. Remove any card(s) from your tarot deck that reminds you of Lammas and what it represents, then place this card(s) in the centre beside the candle. You can also add bread, wheat sheaves, and ears of corn to the middle arrangement. B. Read a quote/poem about Lammas/harvest to set the tone. Or sing a song about this theme. G. After everyone’s cards have been returned to the deck, the central card is shuffled back into the pack. Read a closing poem/quote or sing another Lammas/harvest-themed song. If you’ve included a homemade loaf of crusty bread in the centre, everyone could break off a piece and eat it mindfully before you extinguish the candle. Wheat sheaves and corn, if you’ve placed them in your midst, can be distributed to people to adorn their shrines at home. 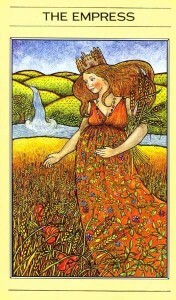 Image: The Empress from the Mythic Tarot. The cards ask the questions — the answers are up to you. 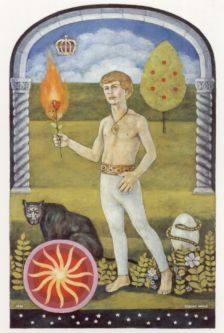 Many of you know that I’m an ardent fan of questions, employing them in the preparation I do for people’s tarot consultations as well as in the sessions themselves, taking them into council circles and casual conversations, dropping them judiciously into workshops and classes, and posting them online. Questions keep the doors of possibility open. Questions stimulate awareness. Questions expand our sense of who we are becoming. To approach your Wisdomsource (however you conceive It) with a topic, issue, or enquiry, then allow a tarot card (or other wisdom device) to generate a question in response to it is a rich and empowering experience, far more so than a blanket pronouncement. If you really take the question into your whole being, let it work you, then respond with naked honesty, you will derive much insight. A greater sense of personal responsibility for creating your own life comes out of such a process. An encounter with a card’s question(s) always makes me feel like I’m aligned with Life and that things make more sense. The questions posed by the tarot practitioner, stimulated by the cards, really take the querent into her or his own Knowing, allowing the person to really own what comes up in the session and to activate the understanding in real life. 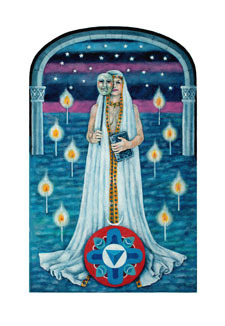 Image: The High Priestess from the Jungian Tarot by Robert Wang.